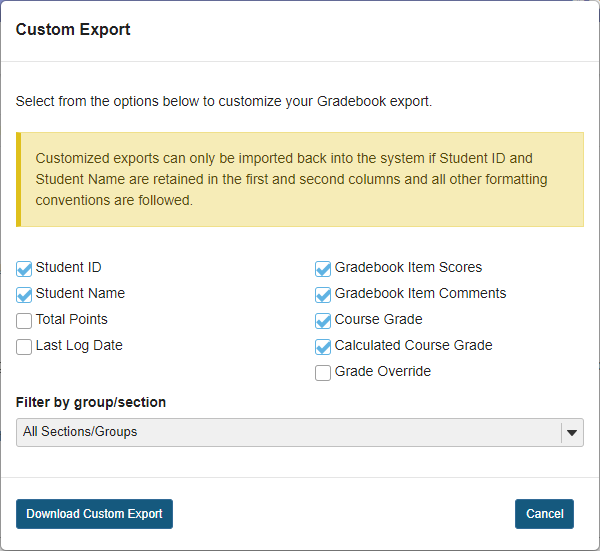 Sakai Community DocumentationSakai 19 User Guide (English) GradebookHow do I export grades from Gradebook? Select the Gradebook tool from the Tool Menu of your site. You may set the options for customized exports by clicking the Custom Export link. Choose the items you would like to include in your export. Prev: How do instructors view and print individual student grades? Next: How do I exclude a grade for a specific student?